The Nuclear Regulatory Commission voted 4-1 Friday to approve power company Scana Corporation's proposal to build two nuclear reactors in South Carolina at a cost of $11 billion. This is the second such approval in two months after a drought that lasted more than 30 years. 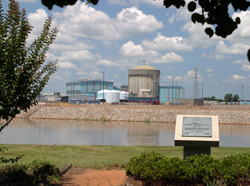 Two Southern Company reactors in Georgia also received the NRC's blessing last month. The Georgia reactors will be built at the Plant Vogtle site. Chairman Gregory Jaczko was the lone dissenting vote. He believes the commission should have required compliance with any changes the agency adopts in light of Japan's 2011 nuclear accident. The two reactors are to be built by Scana unit South Carolina Electric & Gas and state-owned utility Santee Cooper. The reactors will serve customers of both utilities. The license approved Friday clears the way for construction of the two reactors, which will sit next to an existing unit at the Virgil C. Summer nuclear station in Jenkinsville, S.C.